tiger lily, originally uploaded by jahansell. The lillies I showed a few days ago are now in full glorious bloom - here they are, in the driveway of PIne Hill Farm (which I've shown many times). The farmer who runs it has agreed to let me tramp around and take lots more pictures, up in the pastures, in the barns... I hope to get there by the end of this week and create a little series. Ah, these are the essence of summer. Stunning blooms. How nice of the farmer to let you on to his land. Tell him thanks from your blog pals who are looking forward to your photos. 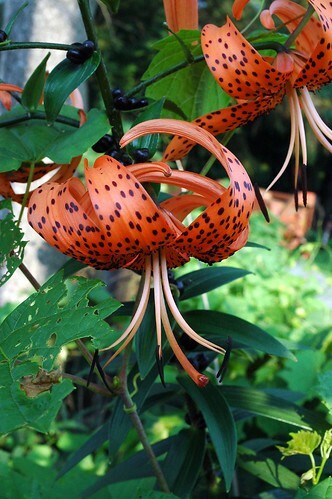 It is a very striking picture of what we used to call a tiger lily. Is that what this is? Beautiful flowers, great follow up pic. I was glad to see it.